Craigmhor Lodge & Courtyard is privately owned by husband and wife team Calum & Jane MacLellan. Our home from home approach, in every area of your stay with us, charms customers from far and wide. 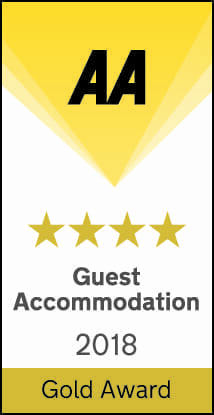 We’re relaxed and informal but still maintain meticulous 4 star standards and pay careful attention to the detail which elevates our guests’ stay from just pleasant to outstanding. Our ethos at Craigmhor Lodge & Courtyard is simple: we want you to have a wonderful memorable stay, leave relaxed and replenished and hope that you’ll return soon. Come away for a break to Pitlochry and learn all over again how to truly relax and let us look after you. Craigmhor Lodge & Courtyard B&B Pitlochry opened in June 2009, The Courtyard is a purpose built, luxury development which incorporates 12 bedrooms and suites. The Courtyard is a two storey building and its proportions mean that our bedrooms are wonderfully spacious. Built in mellow stone and wood, the Courtyard fits perfectly with the Lodge and grounds. The position of the Courtyard offers fantastic views over our duckpond and peaceful forest grounds which is why we have incorporated balconies and garden terraces into the forest facing rooms. Six of our rooms in the Courtyard are on the ground floor, our rooms are ideal for guests with mobility difficulties. Our charming Victorian Lodge in Pitlochry dates back to 1896 and is typical of the period style with well proportioned rooms, high ceilings, intricate cornicing and skirting. The pitch pine doors add that olde world charm to your stay. There’s also a wonderfully relaxed happy feel to the Lodge which makes it feel more like you’re being welcomed into a beautiful home than arriving at your b and b accommodation for the evening. The reception is also located in the Victorian Lodge where there is always a happy smiling face and genuine warm welcome awaiting your arrival. Craigmhor Lodge B and B Pitlochry is a luxurious alternative to hotels in Perthshire. When you are here, why not explore the our Gardens and wooded driveway whilst watching out for our wildlife residents. Our pond is a haven for wildlife with ducks, frogs, hedgehogs and even the occasional beaver! Guests are also welcome to relax on our new swing seats in the garden. Guests are free to relax and unwind in the Lodge with its cosy and tastefully refurbished Lounge and sunny Dining Room overlooking Pitlochry town.